Samruh Creative Association creates high-quality artistic content in the field of culture, media and education. A new museum in Sviyazhsk, Russia, wanted to generate a jaw-dropping effect on visitors as they enter the hall by creating a 21 metre-long animated panorama. 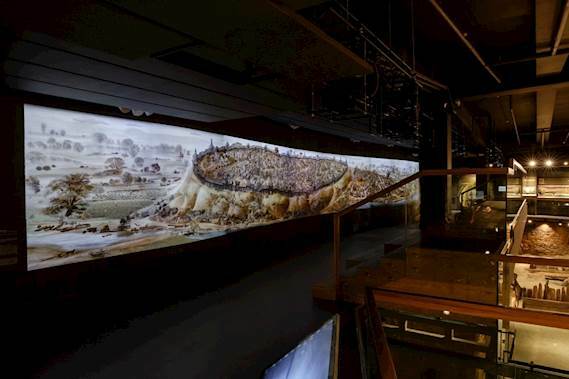 The Archaeological Wood Museum in Sviyazhsk wanted to achieve the wow-effect from a monumental widescreen panorama which would show the castle of Sviyazhsk in the 17th century in 4K UHD resolution. The overall dimensions of the panorama would be 21m long by 2.4m high and would include 450 animated characters involved in 120 household scenes so had to show the finest detail with accurate and rich colour reproduction. The projectors for the display needed to be flexible for ease of installation and require minimal maintenance. The museum needed reliable quality equipment to operate uninterrupted 24/7. In addition, they needed to be small, light and quiet to be inconspicuous in the museum space. The team chose Optoma UHZ65 laser projectors for the display due to its laser technology, 4K UHD resolution, good luminous flux, installation flexibility and light weight. Samruh Creative Association installed twenty Optoma UHZ65 projectors for the panorama. The compact body and light weight of the projectors made it possible to place the projectors to provide optimal illumination of the projection plane, without becoming intrusive, and harmoniously fit into the overall design of the museum complex. Two media servers with Resolume Arena 6 blended the high-resolution content and provided a total projection resolution of 30,000 x 3,879 pixels. All projectors and servers were integrated into the museum’s control system allowing staff to switch the display on and off via its web-based user interface. This means time and resources needed for the maintenance and operation of the display is minimised. Samruh also created the interactive zone: 'Become a Sviyazhsk inhabitant' which allows visitors to leave a small digital twin of themselves to live in the museum. After choosing the gender, place and layer of society in which they would like to live, visitors take a picture. All data is entered into the system and, as they exit, visitors can see a projected avatar of how they would look as a medieval Sviyazhsk inhabitant. Again, the museum chose the Optoma UHZ65 laser projector for this due to the resolution and image quality, reliability of the laser light source and flexibility of installation. Equipped with high-quality laser illumination, the UHZ65 provides consistent brightness, superior colour performance, instant on/off and an extraordinary life span of up to 20,000 hours. Capitalising on the fast switching speed of the DLP chip with XPR technology and advanced image processing, 8.3 million pixels are delivered to the screen without alignment issues, with four times as many pixels as 1080p. This brings stunningly detailed, bright and colourful imagery to the screen. With its sleek black casing and 3000 lumens, the UHZ65 also boasts sophisticated PureMotion frame-interpolation technology. Installation is simple with vertical lens shift, 1.6x zoom and a host of connection options. 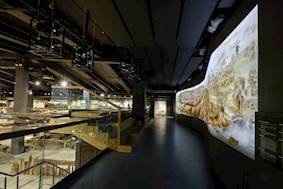 With the animated panorama as its stunning centrepiece, the Archaeological Wood Museum opened in September 2018. It showcases medieval wooden architecture, the restoration and the conservation of archaeological artefacts and life of the population of Sviyazhsk in the middle ages. The huge 4K panorama makes a visit to the museum both memorable and amazing. 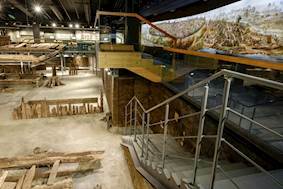 Visitors entering the hall are taken by surprise by the display and linger to explore the panorama as long as 20-30 minutes. Andrey Morozevich, ProScene Optoma manager in Russia and CIS, said: “The use of modern video technologies has become a special highlight and surprise for visitors, where prehistoric archaeological artefacts are harmoniously complemented by informative and fascinating animated visual solutions.